S Korea's 2Q flow of fund accounts, released today, at first sight look rather dour as far as the household sector is concerned. On deeper inspection, however, they are worse than that. But first a caveat: taken broadly, the household sector remains in fine financial conditions, with net financial assets of W1,994.4tr (or US$1.78tr at 3Q exchange rate), and equivalent to 113% of GDP. The household sector has, in other words, net financial assets equivalent to more than an entire year's output. First, during 2Q the household sector’s position deteriorated, falling by 0.7% qoq, or W14.68tr, thanks to a W18.2tr fall in holdings of equities. The 2Q results will, of course, have caught the full force of June's 8% fall in the KOSPI, from which there has as yet been no significant recovery. Still, the fall in net financial assets is a rare event: since 2009 it has happened only three times. In yoy terms, the growth has slowed to 4.1%, compared with a nominal GDP growth rate of 4.8%, and net financial assets/GDP ratio has been essentially stagnant since 2015. 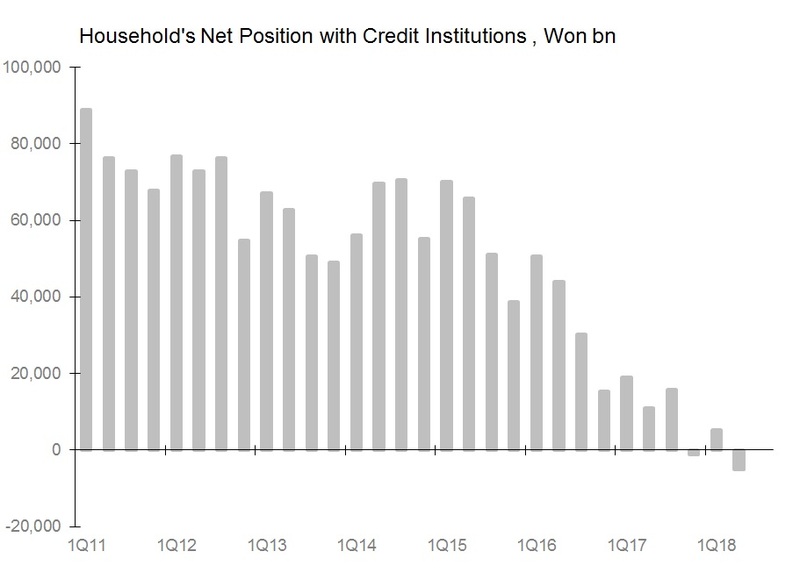 The second problem owes nothing to market volatility: S Korea's households are now net debtors to the nation's credit institutions. During 2Q, household holdings of deposits are currency rose W16.78tr qoq, but loans rose W27.06tr. As a result, the net position of households with credit institutions deteriorated W10.29tr qoq to end the quarter with a net debt position of W5.1tr. This is merely an extension of the continuing deterioration in household's banking position that's been continuing since 2015, but it is only the second time we've seen an actual net debt position. It is worth pointing out that it is now quite unusual in developed economies for the household sector to be net debtors to the banking system: net deposit positions are now the norm - a legacy of the financial crisis. Third, the willingness of the household sector to take on net debt has been useful in helping sustain S Korean domestic demand. In fact, the W10.29tr qoq deterioration in the position was equivalent to 69% of the qoq nominal GDP growth seen in 2Q. Over the last year, the deterioration came to W16.1tr, which was equivalent to 20% of the rise in nominal GDP growth. The implication is that if the Korean household sector becomes reluctant to continue letting its banking position slide, the impact will be felt on nominal GDP growth. And are they reluctant?